A third of people who have checked their credit report in the last two years have uncovered errors, according to new research from uSwitch. 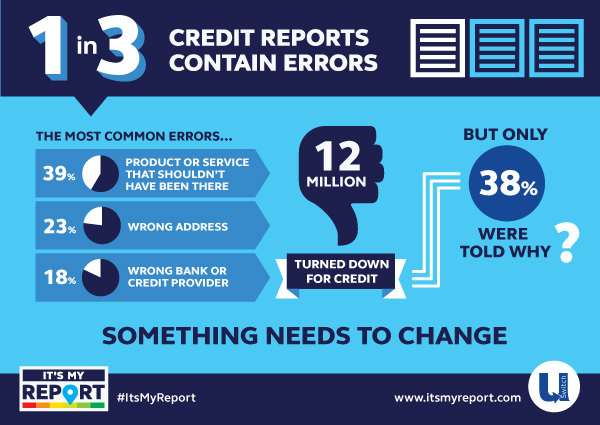 The most common errors uncovered were incorrect credit products or services listed (38%), the wrong address (23%), and the wrong name of the bank or company that gave credit (18%). To learn more visit the It’s My Report campaign page. The research shows that when people are turned down for credit they are not told why – only 38% said they were told by the lender the exact reasons why they were refused without having to ask and 34% of people refused credit were given no explanation at all. This is at a time when personal debt is costing the British economy £8 billion annually, through the damage it causes to family life, employment prospects, mental and physical health as well as the cost to state services. David Mann, Head of Money at uSwitch says: “Credit report errors have a dramatic effect on our ability to access the best financial deals. If your report contains errors, you can quickly find yourself rejected for credit. As a result, the research shows many consumers are turning to more costly forms of obtaining credit and can end up with debt that’s difficult to manage. “We perhaps place too much blind faith in credit reference agencies to maintain accurate data about us, when mistakes are almost inevitable. But the process to correct these errors is lengthy and complicated. The problem is further compounded by there being multiple credit agencies so the incorrect information held about us could be included in more than one report. This makes it harder for consumers to know where to turn. What can I do to correct any errors? Although it is possible to fix errors on your credit reports it’s a lengthy process and many people are confused about how to make changes. If you find an error on your credit report you can contact the lender or bank, and the credit agency who have 28 days to respond, during which time a notice is added to your file so creditors know what’s happening. Make sure you have a point of contact and a reference number to follow this up. The notice of correction can be up to 200 words, free of charge, putting forward your version of events. This will be seen by future lenders along with the information being disputed. A wrong address can be resolved simply by contacting the credit reference agency and providing the relevant proof. There are three credit reference agencies in the UK, Experian, Equifax and Call Credit. Mistakes can vary between these agencies so if you find an error with one agency it could be worthwhile to check the other two as well.